The wait is finally over. After 14 years of anticipation, Incredibles 2 has a lot to live up to. Incredibles 2 finds itself in a tough position. On one hand, in the era of superhero movies, things have become somewhat formulaic. On the other, with such a large time gap between movies, living up to audiences hype is a daunting task. Incredibles 2 handles both of these issues with utmost ease. Let’s dive in (***spoilers ahead***)! 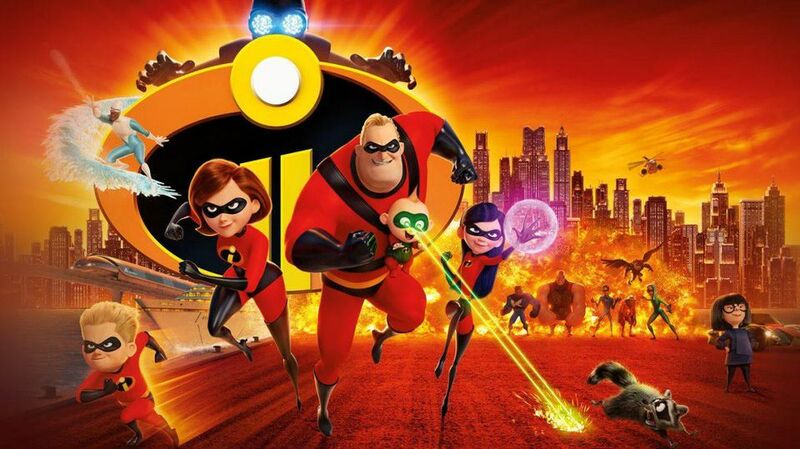 Incredibles 2 puts much of its focus on family. The movie opens with a foe, The Underminer, reeking havoc on the city. The family springs into action in a dazzling display of misguided teamwork. With the aid of Lucius (voice of Samuel L. Jackson), they manage to save the day. Of course, that win doesn’t come without a lot of collateral damage. This display gives lawmakers more than enough reason to cut funding to the National Supers Agency. Dicker (Jonathan Banks) informs Bob (Craig T. Nelson) that two weeks in a motel is all the agency can give them. With their backs against the wall, Bob and Helen (Holly Hunter) must find a way to support their family. While Bob and Helen both struggle to keep it together, Bob believes that supers shouldn’t be illegal. Helen, on the other hand, believes that the law shouldn’t be broken even if it is unfair. Seeing them argue as a real family would show that even superheroes have problems. With the reality of mundane life closing in, Lucius appears offering Bob and Helen an opportunity to help change the law. Enter Winston & Evelyn Deavor (Bob Odenkirk) and (Catherine Keener), the brother-sister duo. They want to show the public just how much supers can do for the world. Bob loves the idea but Helen is selected to be the face of the movement. Putting a positive light on gender equality and parenting, Incredibles 2 shows Helen’s balancing act of not only being a superhero but a working mom. Being a parent is a heroic act, but with the roles reversed, Bob isn’t in a happy place. The moments where Bob struggles with household tasks like helping Dash (Huck Milner) with his homework or trying to keep jack-jack down for a nap really show that superpowers don’t always equal a super dad. Incredibles 2 makes it clear that it doesn’t matter how families divide up their responsibilities. All that matters, in the end, is teamwork. The main villain of Incredibles 2 is a foe named Screenslaver. Screenslaver’s is out to make the public realize that relying on superheroes makes them weak. Why wait for someone else to solve your problem when you can do it yourself? My main issue with Screenslaver isn’t his message, it’s his “power.” He uses television screens to hypnotize people. He hypnotizes us with the very thing we are in a sense hypnotized with, a screen. Which is pretty clever and a deep reflection on society today. The way the movie showcases his power had and has me concerned for people with sensitivity to flashing lights and with epilepsy. Every time he hypnotized someone the screen would flash with bright lights. I didn’t see a warning for the flashing lights before the movie, but I understand that this is now being addressed by movie theaters. If you or someone you know is sensitive to scenes with bright flashing lights, keep that in mind when seeing this movie. Incredibles 2 manages to feel modern in its message and plot points while remaining retro with its aesthetics. It has an amazing jazzy soundtrack reminiscent of classic espionage films. Once again, Pixar showcases careful scoring of their films can highlight certain feelings in a scene. When Helen is closing in on Screenslaver the score becomes very intense and suspenseful. At other times when action sequences break out the soundtrack swells with brass and gets your heart pounding. What I appreciate most is the 60s look infused with a futuristic style. It draws you in with its Adam West Batman-era atmosphere, cars named after the heroes, and the theme songs. This helps to separate it’s superhero feel from the rest of the superhero movies. Incredibles 2 is a really fun movie filled with plenty of laughs and heart. Although the movie has some mishaps with its villain in terms of motivation, it doesn’t hurt the movie overall. The score is fantastic and perfectly captures the tone of the film. The voice acting is strong overall, but it is noticeable that some actors were not stepping out of their comfort zones. I highly recommend this movie for many reasons, but mostly because it delivers on its promise to be the sequel Incredibles fans have been waiting for. Want to rewatch the first Incredibles before seeing Incredibles 2? Head down to your local Bookmans! There’s a good chance that we’ll have all your Pixar movie needs covered in 4K, Blu-ray, and/or standard DVD. 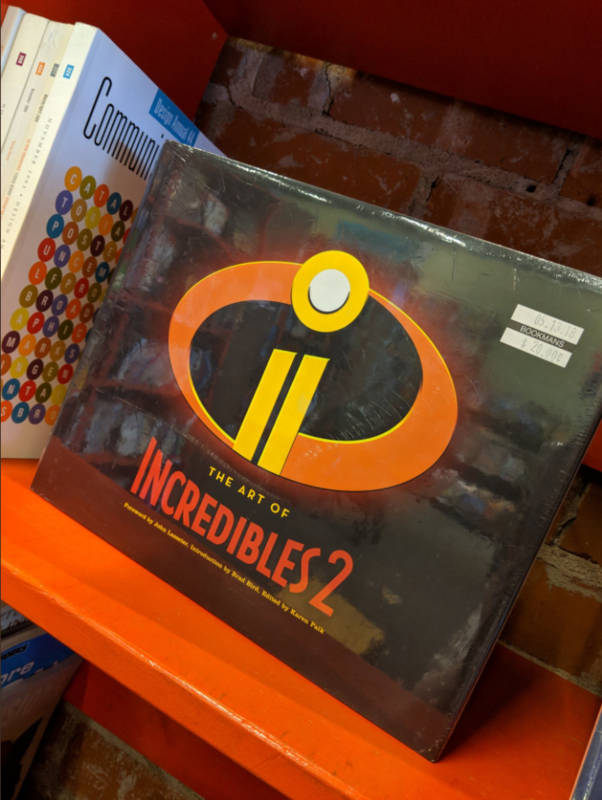 Our stores also often have new editions of those amazing Art of Pixar books, and the Incredibles 2 has already hit our shelves!